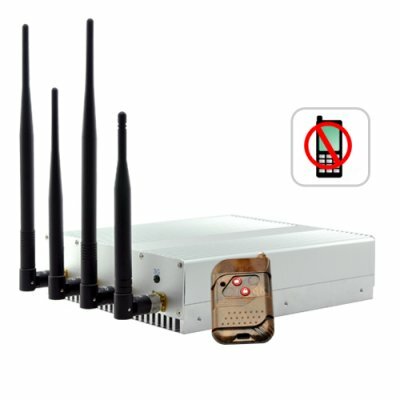 Successfully Added Industrial Strength Cell Phone Jammer (CDMA, GSM, DCS, and 3G) to your Shopping Cart. If you're looking for a high-power, technologically advanced cellphone jamming solution - you've found it with the Industrial Strength Cell Phone Jammer for CDMA, GSM, DCS, and even 3G! This powerful cellphone disrupting device provides industrial strength frequency jamming with four high gain antennas and an impressive 10 watts of output power! The J36 mobile signal jammer has been purposefully designed to wipe out CDMA, GSM, DCS, and 3G mobile phone signals in a 50 meter (164 feet) radius! Easy To Use: No maintenance required. Just turn it on and leave it on! The special casing is designed to dissipate all heat generated, ensuring no down time and circuit protection. What's more, this military strength cellphone jammer comes with a remote control so you can deactivate the jammer from a distance when YOU need to make a call, and activate it when you're done so everyone else is left without cellphone coverage! Click "Add to Cart" now to try out this amazing industrial strength cell phone jammer and we'll express ship you a sample the very next day. From the leader in direct from China wholesale electronics - Chinavasion. Takes out 3G mobile phone signals and more! ISO 9001 factory made - best made Jammer on the market today!